Has the asteroid finally hit? Is the Salvation TV show cancelled or renewed for a second season on CBS? The television vulture is watching all the latest TV cancellation and renewal news, so this page is the place to track the status of Salvation, season two. Bookmark it, or subscribe for the latest updates. Remember, the television vulture is watching your shows. Are you? 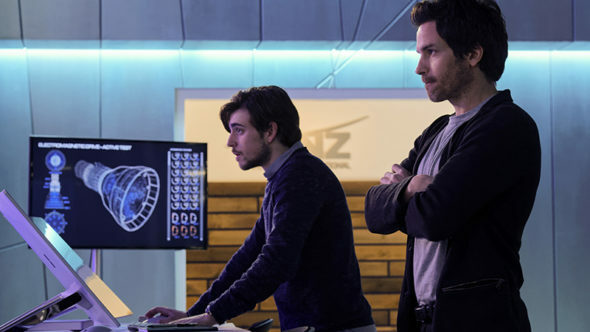 Airing on the CBS television network, Salvation stars Santiago Cabrera, Jennifer Finnigan, Charlie Rowe, Jacqueline Byers, Rachel Drance, Shazi Raja, and Ian Anthony Dale. This suspense thriller follows MIT graduate student Liam Cole (Rowe) and tech genius Darius Tanz (Cabrera). Because they don’t want to cause public panic, the two present Pentagon Press Secretary, Grace Barrows (Finnigan), with evidence that in six months, a huge asteroid will crash into the Earth. Meanwhile, Deputy Secretary of Defense Harris Edwards (Dale) is running the D.O.D.’s top-secret operation to deflect the asteroid. At the same time, Darius is working with Jillian (Byers), a rookie science fiction writer, on a different approach to save humanity. The first season of Salvation averaged a 0.52 rating in the 18-49 demographic and 3.53 million viewers. Find out how Salvation stacks up against the other CBS TV shows. On October 18, 2017, Salvation was renewed for a second season which will debut on June 25, 2018. Stay tuned for further updates. Salvation premiered with low ratings and they’ve gotten even worse. Unless CBS has made enough deals to cover a good amount of the costs for this series, I would be shocked if this series came back for a second season.Subscribe for free updates on any cancellation and renewal news. 10/18/17 update: CBS has renewed Salvation for a second season of 13 episodes. Details here. Find more Salvation TV series news or other CBS TV show news. What do you think? Are you glad that the Salvation TV show was renewed for a second season? How would you have felt if CBS had cancelled this TV show, instead? We were not aware of this show during the summer of 2017. Just happened on it and ended up spending last 2 weekends watching the entire 12 episodes. We loved it. Very entertaining. Sure hope to see a second season on this. I subscribed to CBS all access and want to continue watching “Salvation”, CBS execs.. pay attention to your subscribers!!! Best high tech/syfy show I have seen so far this year. But since I start watching it…..it will probably be canceled! !! Definitely want to see Season 2!! Awesome show!!! I will Step up to protest for a second season with the other fans here… Salvation is Awesome and we need more! Great series with tremendous potential! Summer & cbs time slot was not good! Fall/Winter would’ve been much better!! I watched on Amazon. Please don’t leave us hanging!! My husband and i were looking on Amazon for something to watch. Just happen to come across Salvation. We have binge watched this show for three days. Please renew it for a second season. Although I really like the show, I can’t see it continuing due to the storyline. They were too close to the time left in which to deflect the asteroid at the end of season one. Time before impact is over 100 days , so if they make an episode for each day , then Salvation can have at least 6 seasons more ! Have you ever heard of a serie called ” 24 ” ? I’d LOVE to see season 2 of Salvation! Will be aggravated to all H*ll if this show is cancelled. Have enjoyed every episode 1st season. Bring on Season 2 Asap!! Very good show. Looked forward to seeing it all week. Miss it now that it is over. Much better than the so called reality shows. REALLY hope it will return. BEST new show in a long time. A must watch in our home. Great multifaceted story line and characters with depth. Please renew CBS.